Bishopville became home to a small Jewish community some time around the turn of the 20th century. The town forms a geographical triangle with Sumter and Camden, each approximately 20 to 25miles from the other. While the community did not endure, Jewish businesses were an important part of commercial life in Bishopville in the first half of the 20th century. The majority of Bishopville’s Jews were Conservative. For the few who were Orthodox and kept kosher, Rabbi David Karesh would come every two weeks from Columbia to butcher chickens. They organized an informal congregation that met together regularly to pray. 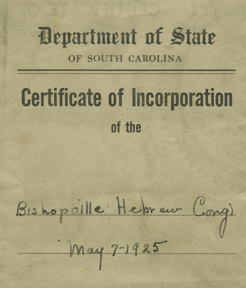 Officially incorporated in 1925 as the Bishopville Hebrew Congregation, the congregation met in the Masonic Hall over Frank Sindler’s men’s clothing store where they stored their Torah in its Ark. Oscar Levy was its first president. Rabbinical students from New York were hired to conduct High Holy Day services and the families celebrated holidays such as Purim and Sukkot as a community. Holiday services were conducted in Hebrew and men and women sat separately, although the seating arrangements were not strictly enforced. Like Camden’s Jewish children of the early 1900s, Bishopville’s children attended Sunday school in their own town and in Sumter. Some of the boys were bar mitzvahed in the hall where they held services, followed by a reception in their homes or the American Legion Post. Burials generally took place in Sumter’s Jewish Cemetery. Most of the Bishopville Jews were merchants, although a number were in the livestock business. The Jewish community suffered a significant blow during the Great Depression. The economic hardship caused a considerable number of families to leave Bishopville, many returning to the cities. By the 1950s, the congregation was so small its members were no longer able to afford a student rabbi for holiday services. Those children remaining traveled to Columbia or Sumter for Sunday school. The congregation, no longer viable, donated its Torah, books, and candelabra to Columbia’s Conservative Synagogue Beth Shalom.